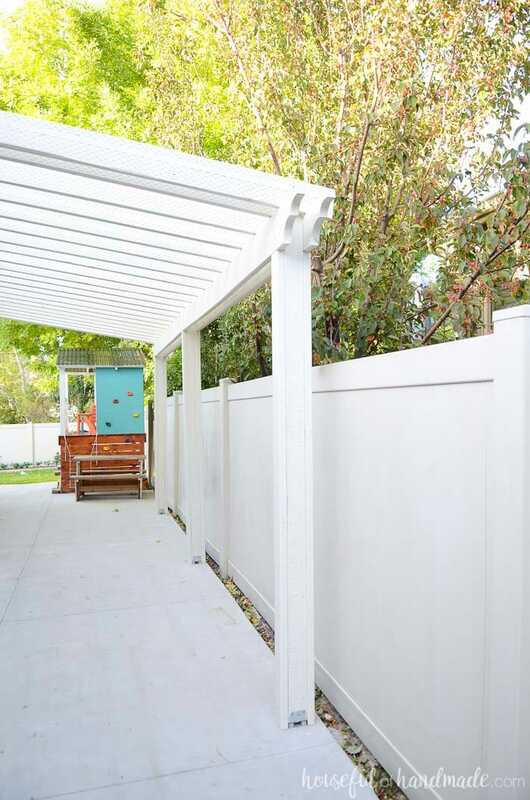 Build a patio pergola attached to the house to extend your living space to the yard. 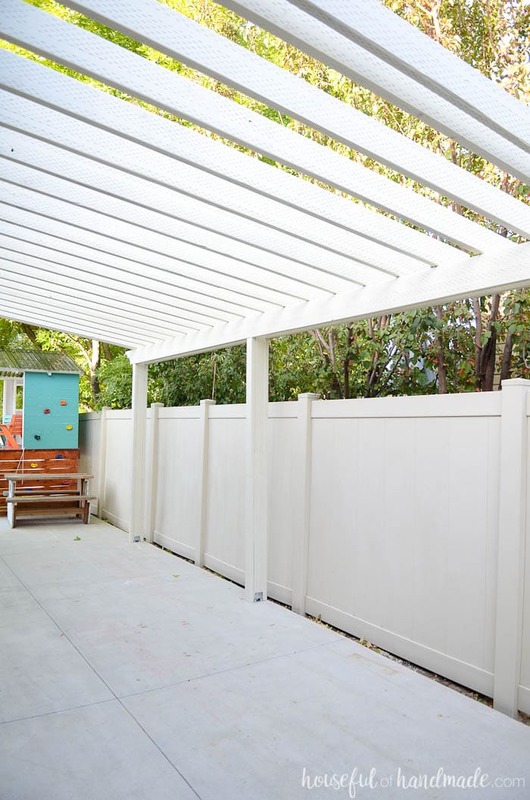 A DIY pergola creates a room outside for entertaining and gathering. 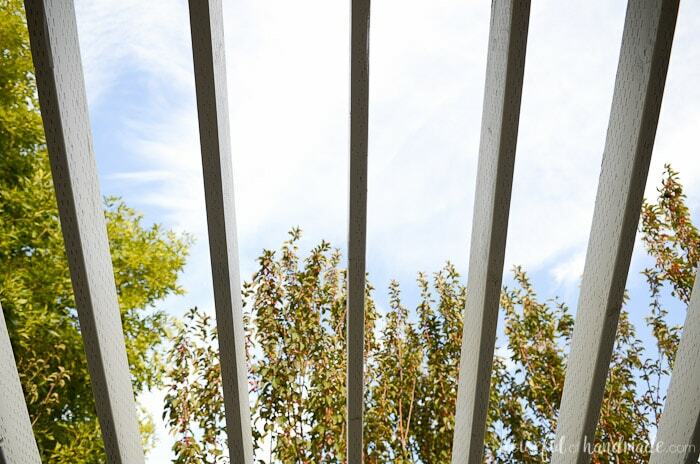 See how we built our patio pergola to help define the perfect gathering space for our family. We partnered with the Home Depot to turn our long side patio into a oasis on a budget. A pergola attached to the house was the perfect solution to create an outdoor dining and kitchen area. 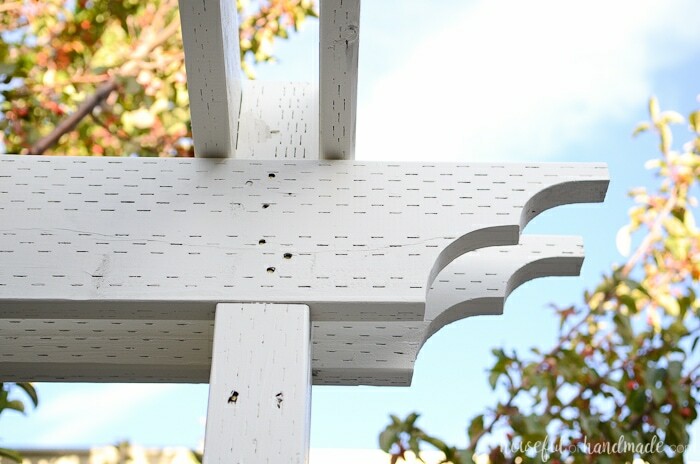 Today’s post shares the DIY pergola build. We wanted to share our patio pergola project in September. We bought the wood, made the plans, then the rains came! Oh my goodness, it rained and it rained and it rained! I don’t ever remember that much rain in September. The first month of fall is usually so nice. Not too hot, but still almost like summer. I think because I really wanted to build a big project outside, this year it decided to rain instead. We managed to sneak in an evening of building and installed all the posts before it was too dark, but then when we had another day to build, it was raining again. I am pretty sure our neighbors thought we were crazy. All we had were three half-painted posts coming out of our patio for weeks. Thankfully, the first day of October, the rain stopped. It was cold, but I would much rather build in the cold than the heat so we got to work. With the help of my father-in-law, we were able to get almost the entire 20′ x 11′ patio pergola built in 6 hours of work. Then another day of finishing up and painting and the DIY pergola is done! I am almost too excited to share it because I thought this day would never come. 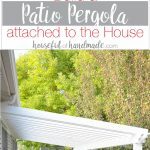 So why a pergola? Well, when we finally got our concrete patio poured this summer, I knew I wanted to create a gathering place. We love to bring together our friends and family around a table. We actually purchased our home because it was the only one with a dining room big enough for the giant table I had already bought. So creating an outdoor entertaining space was perfect. 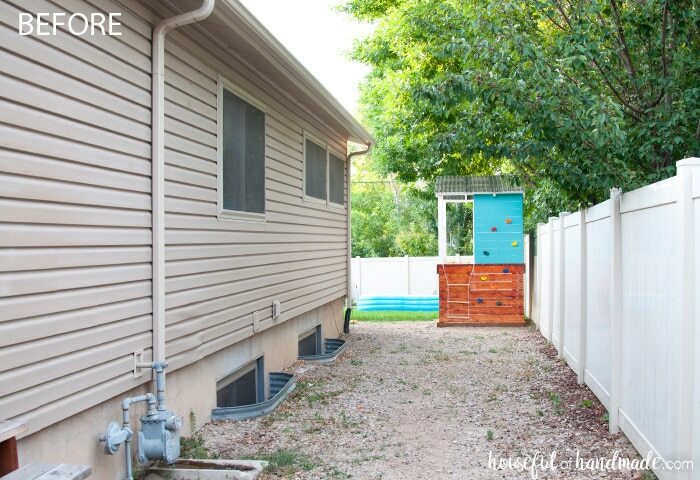 Our bowling alley of a side yard seemed like the perfect place to create this big entertaining space. I could have just thrown a table and chairs into the space and called it done, but I wanted to create a room. Sometimes, large spaces can be harder to decorate so defining the space, with something like a rug or pergola, makes it easier. 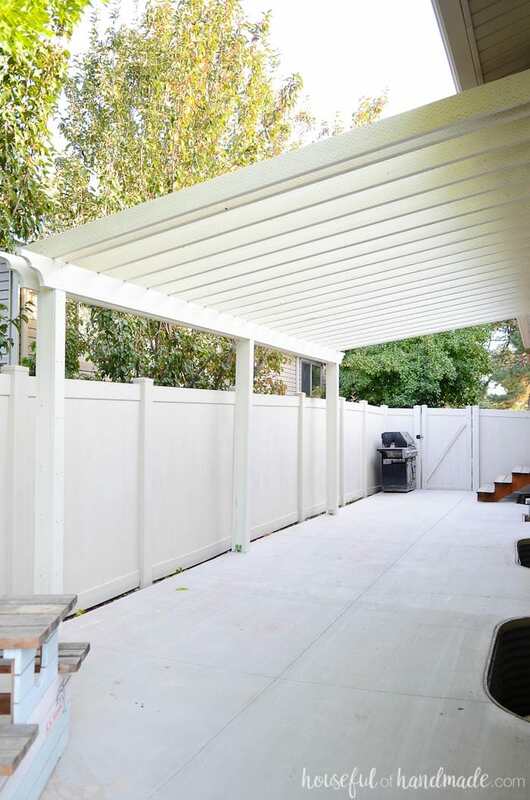 A patio pergola was the perfect way to define the outdoor dining space on the long patio. At first I thought a pergola might be too expensive though. We would need a rather large one fit in everything we wanted in the space. But I was determined to find a way to fit it into our budget. Thanks to the Home Depot we did it! Would you believe we built the entire pergola for around $700? We used pressure treated lumber instead of expensive redwood or cedar. It will hold up to the elements, but costs much less. Then because I want it too look expensive (even when it is not), we painted it with a soft white paint to match the house. 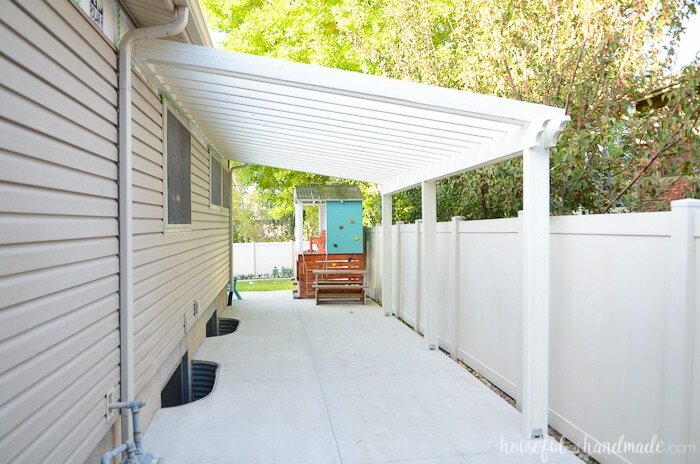 And I absolutely love our budget pergola! 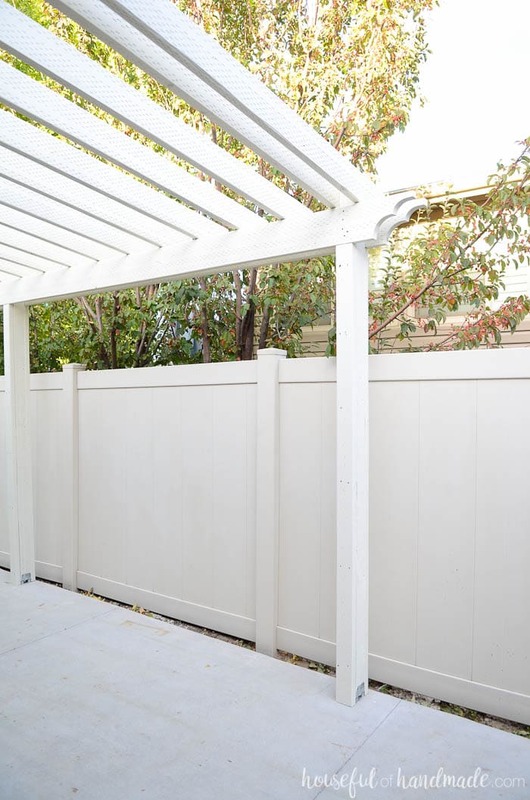 If you have ever wanted to build your own patio pergola, then this is the perfect post for you. We encountered a few challenges (besides the month of rain) and I am excited to share it all with you. 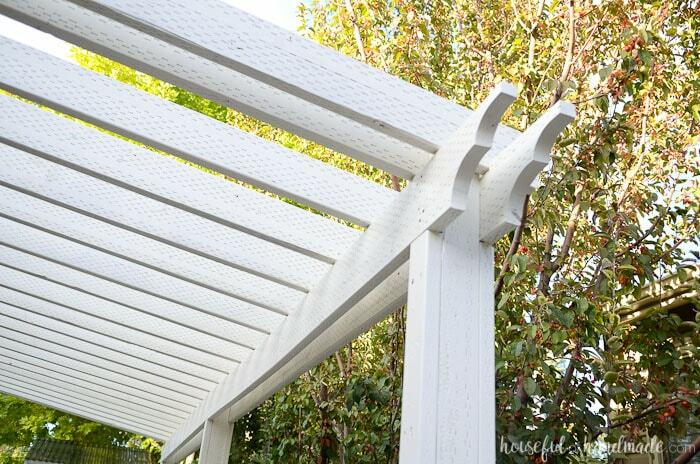 Building a pergola attached to the house is a big project, but totally worth it. Next we are going to cover the patio pergola so we can use it even if the rains come again. Then it’s time to add all the elements to make the perfect outdoor entertaining space for our family. To see the complete build of our 20′ x 11′ patio pergola, click the arrow below. Then don’t forget to come back as I will be sharing all the rest of the patio goodness with you too! Hi, love your work. The pergola is beautiful. Does it provides enough shade on hot days with the clear roof. Trying to decide if I can do a clear roof when I build. I didn’t realize how much it protected from the sun until I tried assembling a new grill on a very hot day last year. The pieces left underneath the pergola didnt get hot and I felt much cooler under it. But just outside the pergola it was HOT! But it’s not really shady, it just blocks the UV and therefore a bit of the heat. Hope this helps. That is so beautiful and functional! I’m wondering if rain coming from the clear panels jumps the fence to the neighbor’s yard, or does it fall into your yard? Do you have any draining issues? Thanks for this tutorial! The rain will fall on the edge of our yard. The patio leaves about a 3″ space between the edge of the concrete and the fence where the water can fall so no draining issues. If you have don’t have a place for the water to fall, you can add a gutter to the edge of your pergola to direct the water where you want it. Hadn’t thought about a gutter. Great idea, thanks! Did you install flashing over the ledger board where it attaches to the house? We did not because it was so close under our roof line. But they make things to work for lots of different types of house exteriors. Looks bright and beautiful. You will have to keep us posted on how you decorate the area! !